Find the best automatic litter box here! What is the Best Automatic Litter Box? No more scooping the box daily–most boxes need cleaning just once a week…or even as infrequently as once a month! Greatly reduced odor–ideal for small homes and apartments. Save hundreds of dollars or more on expensive litter–automatic boxes are very efficient with litter usage. Can be used by pregnant women or people with compromised immune systems–you never need to come into contact with dirty litter, since the litter box does all the scooping for you. This helps you avoid infection from the parasite toxoplasmosis, which is often found in soiled cat litter. If you’re ready to buy but don’t know which model is best for your home, you’re in the right place. Below, you’ll find a comparison of the top automatic litter boxes for sale in 2013. I’ve done all the research for you, so all you need to do is find your favorite model in this handy chart. After that, you’ll find a list of automatic litter box reviews written by me. Click one of those to go to the detailed review page for that product. Click the link above any litter box to go straight to its Amazon page. You’ll find hundreds of real customer reviews to help you make a buying decision. 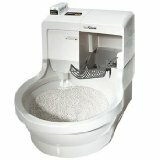 With free shipping for most items and no sales tax in many states, Amazon is one of the best places to buy an automatic litter box from. 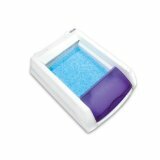 Automatic Litter Box – The name and picture of the litter box, plus a direct link to its page on Amazon. Weight & Size – The litter box’s weight in pounds and dimensions in inches. Color – The colors the litter box is available in. Multiple Cats – Whether or not the box can support multi-cat households. Pros – The best things about the litter box. Cons – Complaints or possible faults of the litter box. Free Shipping on Amazon – Whether the box will ship to you free if you buy on Amazon. Currently, all the boxes listed are eligible for free shipping. Average Rating – The average rating of the box based on Amazon customer reviews. To sort the litter boxes, click on the column title. You can sort by price or average review, for example. Here’s some more information for each litter box compared above. Click on a product name to read a detailed review. The Litter Robot LRII is one of the best automatic boxes sold today. Its sensors detect when a cat’s using the box, and it sifts litter automatically after the cat exits. Waste falls through a grate into a bag held in a hidden tray. That tray means no visible animal waste and reduced odor, so this box is great for high-traffic areas. You can use your own litter, so there’s no extra proprietary supplies to purchase with this box. 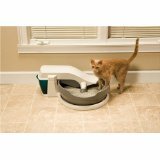 The Omega Paw is an economical alternative to the Litter Robot LRII. It doesn’t need electricity or batteries to run. Instead, you just roll the box to the right and litter goes through the grate into a large plastic scoop. Empty the scoop into the trash, and you’ve just cleaned the litter box in under a minute. The Omega Paw works with your own litter. The Tidy Cats Breeze is a very simple, easy-to-use box. Its main draw is that it separates liquid and solid waste. Liquid waste goes below the box into a tray, where a special absorbent pad soaks it up. Solid waste remains in the box, but scooping is much easier with the Tidy Cats dust-free litter pellets. The pellets don’t clump or track, so there’s no big mess to scoop up. Here’s a cool litter box that actually flushes like a real toilet once your cat has done his “business.” It hooks up to the water line for either your toilet or the washing machine. Waste empties into the toilet bowl, where it can be easily flushed, or into the washing machine drain depending on your setup. This hand-operated box is comparable to the Omega Paw box. Just spin it once, and your cat’s waste falls through a grate into a hidden compartment. It works with any clumping litter. 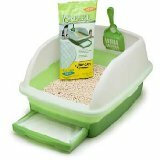 The ScoopFree automatic litter box uses a raking system to collect your cat’s waste. It works with special disposable litter trays that come pre-filled with odor-absorbing blue litter crystals. You’ll only need to change the tray once every 30 days if you’ve got one or two cats! 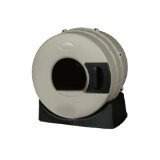 The PetSafe Simply Clean is one of the quietest automatic litter boxes on the market right now. It’s so quiet that it won’t disturb you at night. Got a sleeping baby who’s easily awoken? Then this is the box for you! This box uses a conveyor belt mechanism to rake up waste and move it into a separate container. When the container gets full, just detach it and dump the waste in the toilet or trash can. 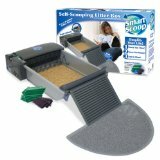 The SmartScoop Self-Cleaning litter box is comparable to the ScoopFree brand. Like that box, this one also uses a raking system to eliminate waste. Waste is pushed into a large hidden scoop for easy removal. You can use any type of clumping litter or bags with it. According to most Amazon user reviews, LitterMaid is among the worst brands for automatic litter boxes. For example, common complaints say that most boxes don’t scoop litter thoroughly and the rake system leaves clumps in the box. The cycling mechanism also tends to fling litter out of the box. The LitterMaid Elite Mega model is one of the worst offenders. Click here if you’d like to see customer reviews for this box. If you really want a LitterMaid, opt for one of the better-reviewed models, such as the LM680C Classic or the LM980 Mega. Automatic cleaning litter boxes come in two types: electronically operated or hand-powered. The hand-powered types are not truly automatic, but they virtually eliminate the need to scoop and clean the litter box. With most of them, you only need to roll or tilt the box to sift waste into a separate container. You can then detach the container to get rid of the waste. 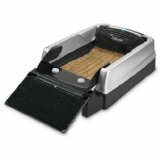 Electronic litter boxes handle the rolling, scooping, and raking for you. They require a connection to an electrical outlet, but they don’t usually require much power to run. That’s because these boxes usually only run after the cat has used them. Electronic boxes are the ultimate in convenience, but they’re also typically more expensive than hand-powered ones. Their need for power limits where in your house you can put them. Hand-powered boxes can be put almost anywhere. They don’t contain any motors or electronic parts that could break down, so there’s rarely a need to repair them. Not all automatic litter boxes are the same size. Some take up a huge piece of real estate in your home. If you buy a box and later find out that it’s too big for your home, it’s a big hassle to return it. Measure the area where you’d like to put your box before buying one. After that, check a box’s size before purchase. I’ve listed the size of each box in the comparison chart above. If you opt for an electronic box, you’ll likely get one that eliminates wastes by either rolling or raking it into a hidden compartment. The rolling-style boxes tend to have more positive customer reviews. Raking style litter boxes do work, and some of them are very good. Bad raking-style boxes, however, will often miss chunks of waste and leave it in the box, so you’ll end up needing to scoop it anyway. Always check user reviews before purchasing any box to make sure the mechanism works well. 4. Works with Any Litter or Requires Special Equipment? Many automatic boxes allow you to use any type of clumping litter, and you can collect waste with a simple grocery bag. Others, like the Tidy Cat Breeze and the CatGenie, require special litter crystals, pellets, or granules. This special litter is usually more sanitary and odor-absorbent than regular litter. If your box needs this litter, it’s another ongoing expense. Also consider that some boxes need specially fitted bags, carbon filters, or other equipment that needs replacing. Find out what a box needs before committing to a purchase. Lots of cats need privacy to use the restroom in peace. If yours is like that, then you’ll want a box that comes with a lid. Almost all automatic boxes with a lid allow you to detach the lid for cleaning. On the other hand, if you’ve a very large cat, you probably won’t want a cover. If you do opt for a privacy cover, how big must the entrance hole be? It’s not uncommon for buyers to realize, after they’ve already set up their new box, that their poor cat can’t squeeze into the entrance. If a cat needs to struggle to get inside the box, he’ll likely take his “business” elsewhere. Many cat owners will pay nearly anything for an automatic litter box that works properly. How much is your budget? Most automatic boxes start at $40 and up. For a really good box, expect to pay between $80 and $100. Remember, even if a box is cheap, it’s not a good deal if it breaks down after a month of use. Most automatic litter boxes are pretty big and heavy. If you buy them in a pet store, you’ll need to drive to the store, haul the box into your car, get it out of the car, and then get it inside for setup. If you buy online, you’ll have the litter box delivered right to your doorstep. Worried about shipping costs? Surprisingly, many automatic litter boxes actually ship for free if you order from Amazon. And in certain states, there’s no sales tax either! That can help you save a bundle. What Litter is Best for Automatic Litter Boxes? Here’s a roundup of some of the best litter brands available for automatic boxes: What’s the Best Cat Litter for Automatic Litter Boxes? Need a litter mat to go with your new automatic litter box? Read: What is the Best Cat Litter Mat? 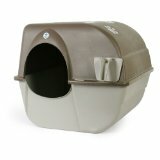 What is the Best Automatic Litter Box for Multiple Cats? 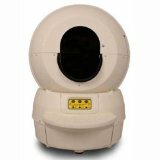 Any medium to large automatic litter box will work great for multiple cats. Most litter boxes featured here support at least 2 cats, but usually up to 3. Many companies recommend that you purchase one box per cat. For tradtional litter boxes, this is sound advice. But automatic litter boxes are always filled with clean litter, so this isn’t as much of an issue. The only thing multiple cats really affect is how often you’ll need to change the litter box, just the same as you do now. The litter box will function just fine–although if your cats really like it, they might start fighting over it!